Hi there! Today I’m sharing a review for a new YA fantasy from Elly Blake. 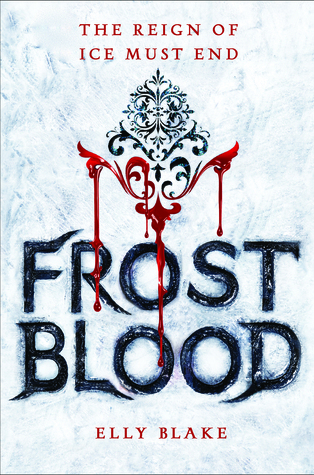 FROSTBLOOD is the first book in a series set in a world where some are born to wield flame or frost–and the Firebloods, like 17 year old Ruby, have been hunted to near extinction. Why would she ever agree to help the Frostbloods do anything? Oh, right, to kill the merciless Frostblood king…. Ruby is a teen girl unsure how to manage the demands of her Fireblood heritage in a land where being a Fireblood is a death sentence in itself. Born with the ability to wield fire from her hands, she must release some of this power now and then or she feels pent-up and unstable. She always hides deep in the woods outside their remote village to test and release her fire magic, but the day comes when the Frostblood King’s soldiers find her and burn their village for daring to “harbor” a Fireblood. They also kill her mother right before Ruby’s eyes. She’s imprisoned, kept in a state of complete damp and cold to douse her flames, and starved nearly to death, only to be rescued by a Frostblood master, Brother Thistle, and his protector, Arcus. They vow to save her if she will help them kill the king–and that’s a bargain Ruby’s all too eager to make. Safely ensconced in an abbey to Fors, the god of Frost, Ruby is trained by Brother Thistle in the safe wielding of her flames, and by Arcus in hand-to-hand combat and swordsmanship. Not all the monks are in favor of keeping a Fireblood nearby, however, and view Ruby’s training as traitorous to the throne. Over time, Ruby and Arcus develop a camaraderie that slides into attraction. She’s there for several months, as the attack on the king is planned for the summer solstice, the time when Ruby’s fire magic will be naturally at it’s zenith. But, she’s frustrated when she learns that the total plan isn’t necessarily to kill the king. It turns out that his ice throne, fashioned by Fors a thousand years before, has been corrupted by dark magic, and Thistle and Arcus believe that darkness has inflicted a madness on the king. Perhaps if Ruby melts the throne, she can restore sanity to the king, who can then call off the hunt for Firebloods. Ruby isn’t in love with this plan, and feels vengeance is hers to claim–but she’s captured by the king’s soldiers before she and Arcus can mount their siege. Being a Fireblood, Ruby is pressed into the King’s gladiatorial entertainment, fully expected to be killed in her first event. When she wins–aided by magic that isn’t hers–Ruby knows she’s living on borrowed time. If only she can get her flames on the King’s throne before her life is snuffed. For a fantasy, I really found the realistic development of Ruby as a heroine to be excellent. She’s not a quick study. She gets frustrated. She makes mistakes that harm her, and those around her, but she’s valiant and determined. Ruby wants to be useful, wants to help herself and all the Firebloods, and Brother Thistle is a patient teacher she wants to please. Arcus is moody and mean-spirited at times, pushing and prodding Ruby to get her off-center. He knows the kind of battles she’ll face if they can get her into the King’s court, and his tough-love approach felt realistic, as well. Her experiences in the King’s court are filled with intrigues, humiliation, and brutality. She’s forced to meet her mother’s killer many times, even in battle, and Ruby has to keep her wits clear to keep herself alive. The magic that afflicts the King is in play throughout the court–and Ruby’s not immune. She has the opportunity to embrace this power, and change her place in the world dramatically, but her deep rapport with Thistle and Arcus keep her grounded in a way she hadn’t expected. The worldbuilding is really good, with scenes that are fleshed out and a menacing tone imbued throughout the prose. The juxtaposition of ice and fire was a constant theme, and related not just their powers but also the emotional landscape of the players: hot-headed Ruby has burning passions, while Thistle and Arcus are cool, collected and calculating. The love story that develops between Ruby and Arcus is quiet, with only a few moments of acknowledgment before the climax. It seemed a natural progression of their time spent together–from wariness to acknowledgement, to friendship, esteem and eventually attraction. Arcus has a dark history, and his desire to destroy the throne is tied to his intimate knowledge of the king and the monarchy. I was happy that my suspicions regarding his heritage were accurate. I liked the rawness of the experiences that Ruby endures, and how her personal tragedies help forge her into a warrior ready to save herself and those she loves. This book is slated as the first in a series, and ends in a way that completes the initial story arc. There is no cliffhanger, and I expect the next book will have a whole new set of troubles for Ruby to solve–with Arcus at her side. Interested? You can find FROSTBLOOD on Goodreads, Amazon, Barnes & Noble, iBooks and Kobo. I received a review copy via NetGalley. You can catch up with Elly on her website, Facebook and twitter. Book sounds interesting. Thanks for sharing your review.